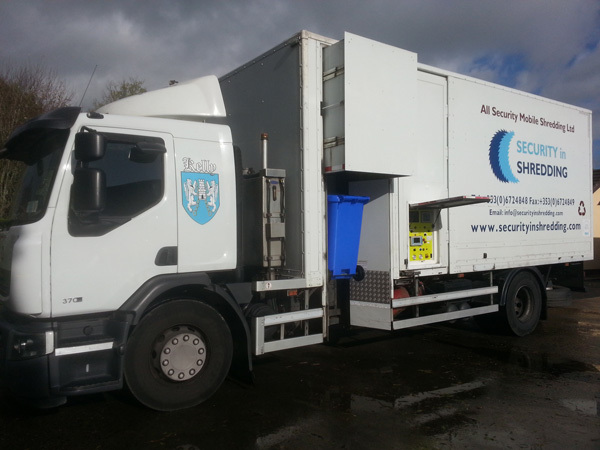 Confidential shredding in Cork and throughout the country can incorporate a off site document shredding service to promote good business practice. Internal Data classification and identification is when an Organisation tags their data so it can be managed effectively, securely processes, found quickly and destroyed appropriately. It is a beneficial exercise for many Organisations as it helps to de-duplicate data stored on devices, this de-duplication vastly speeds ups data searches while also saves upon revenue in the form of storage capacity and back-up requirements for a given Organisation. This exercise is also required for Organisations who need to meet legal and regulatory requirements for destroying the information beyond reconstruction, not holding information longer than necessary in addition to enabling an Organisation to retrieve specific information within a set timeframe. Data strategies vary significantly from one organisation to another for many reasons. For example, many may generate different types and volumes of data that are subject to differing legislative requirement and responsibilities. The balance of information type can vary from one user to the next between e-mail correspondence, images, video files, office documents, customer and product information, financial data just to name a few. It may seem a good idea to tag and classify everything within your Company database however experts here and abroad advise against this due to high costs and success rates within Organisations. Certified database technology is available for Organisations however; this method seems to work best for Governments with an allocated budget for the activity. Alternatively, it is advised that Organisations can choose certain types of data to classify into the main segments of your business, for example; account data, personal data and commercially valuable data. It is advised that an Organisation’s data is to be classified in line with their confidentiality requirements. It is important to carry out an information audit at this stage which in turn will give you an accurate view of the nature of the data. It is essential for an Organisation to ensure that the data it is classifying is of good quality, “Common pitfalls for Organisations is that too much rubbish is allowed to accumulate, from duplication to copies of office party photos to personal letters to bank managers”, storage cleansing technologies are extremely useful at this stage to eliminate obsolete, trivial or redundant content. Once the classification system is up and running it is important that management and staff take part in periodic reviews as it is not set in stone and business developments can translate to design changes in data classification. Once the data has been classified an Organisation is empowered with the ability to tailor procedures for specific data in order to maintain regulatory compliance. Secure Destruction of Sensitive data. When destroying information whether it be hard paper data or digital data on data carriers it is essential for Organisations to ensure that they comply with regulations and are not proving to be negligent in their processes. For this reason, we have constructed three different protection classes for data that requires specific attention to ensure that the material has been destroyed appropriately. Protection 1:Normal security requirement for internal data Unauthorised publication or dissemination would have a limited negative impact on the company. Protection of personal data must be ensured. There would otherwise be a risk to the position and financial situation of the affected persons. Unauthorised dissemination would have a considerable effect on the company and could infringe legal obligations or laws. A personal data data-breach would result in considerable risk to the social standing and financial situation of the affected persons. Protection 3:Very high protection requirements for particularly confidential and secret data. Unauthorised dissemination would have serous terminal consequences for the Company and infringe upon trade confidentiality, place a data subject at risk of safety or freedom, break contracts and legal law. It is essential that the confidentiality of personal data is maintained. Destruction activities must be carried out in line with a detailed procedure, all staff carrying out destruction activities are to be trained. Alternatively, destruction processes are to be implemented and provided through a data processing firm receiving all data processing certificates for completion of destruction. All data is to be destroyed to shred No. 3 of EN 15713. Destruction processes of data in protection class No. 2 are to be implemented and provided through a data processing firm receiving all data processing certificates for completion of destruction. All data is to be destroyed to a minimum of shred No. 3 of EN 15713. The data processor must be registered for their services. Destruction processes of data in protection class No. 3 are to be implemented and provided through a certified data processing firm receiving all data processing certificates for completion of destruction. All data is to be destroyed to a minimum of shred No. 5 of EN 15713. The vendor must be independently certified to destroy paper and digital data beyond reconstruction and they must be registered for their services with the policing authority in the relevant Country. Visit: https://www.securityinshredding.com/ for more information on a confidential shredding service. This entry was posted in Confidential Shredding, Corporate Social Responsibility, Data Protection and tagged Confidential Shredding, Data Privacy, Data Protection, Data Security, Dublin Document Shredding, limerick paper shredding by Security in Shredding. Bookmark the permalink.